Here's how you can go about tracking down and killing the Teostra of Monster Hunter World. Teostra the Infernal is one the few Elder Dragons featured in Monster Hunter World, and it's definitely one of the more aggressive beasts in the game. In our Monster Hunter World Teostra guide, we'll be walking you through everything you could possibly need to know about the beast, including how you should go about taking it down, and more. If you instead need anything else on the complex game of Monster Hunter World, including how to successfully capture monsters using a Shock Trap, as well as how to track down a monster using the Scout Flies, then head over to our Monster Hunter World guides walkthrough hub. You can track Teostra the Infernal across the Wildspire Waste location of Monster Hunter World, which is actually one of the easier regions to deal with in the game, considering how relatively flat and open it is. You'll want to start from the Southwest Camp, and try to make your way into the center of the Wildspire Waste. As usual with tracking Elder Dragons in Monster Hunter World, you're going to be finding plenty of footprints for Teostra the Infernal, each of which will fill up your tracking gauge by 10 points. If you're struggling to find any markings of the beast, simply head back to Astera and re-enter the region, as doing this will completely reset the markings of the monster, but it won't reset your tracking gauge, meaning you can just continue where you left off with all the tracks back in the same locations across the Wildspire Waste. It’s important that you take the Health Booster item with you, which is useful for regaining any damage that the fiery environment deals to you, as well as healing you teammates whenever they take damage from Teostra itself. 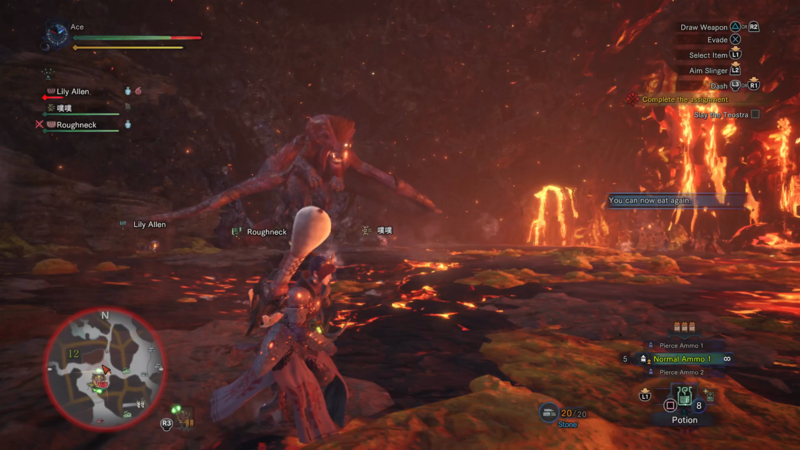 As with the Nergigante and Kushala Daora fights, you’ll want to fire off an SOS Flare as soon as you can to summon hunters to fight you, unless you’re feeling particularly plucky. More players puts less of a burden on you, and it means you can back away from Teostra and heal whenever you need to, letting your teammates draw the ire of the Elder Dragon. As for weapons to take into the fight against Teostra the Infernal in MHW, it’ll depend on whether you’re venturing in with a team or not. 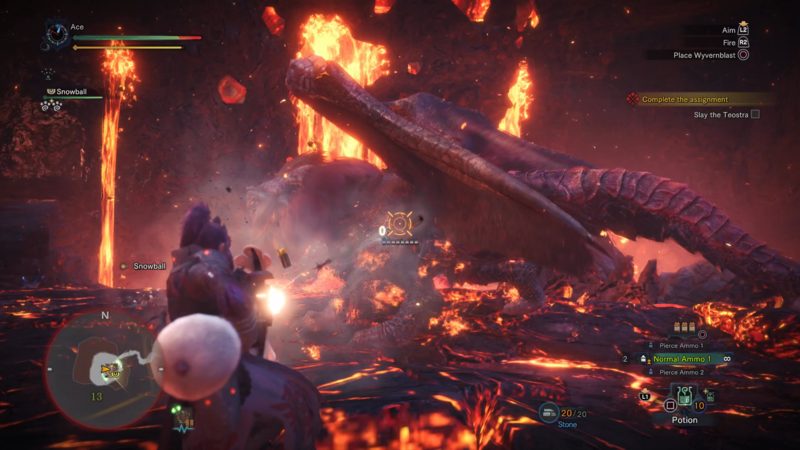 If you’re going in on your own, we’d recommend taking a quick weapon, like the Dual Blades, Long Sword, or Insect Glaive in particular, since it’s entirely possible to mount Teostra. If you’re going in with other hunters, then it’s best for at least one person to assume a ranged role with a Bowgun or Bow, and the rest to take up close quarters positions, with at least one light weapon and heavy weapon, like the Hammer, Switch Axe, or Great Sword, among them. Teostra the Infernal has a lot of area of effect attacks at its disposal, with just a few simple swiping attacks that it can execute in close quarters. Every single one of its area attacks is fire based, so you’re going to have excess fire damage piled on after the base attack hits if you get caught by any of them. The general rule is to back off as quickly as possible whenever you see any small sparks around Teostra, as this signals it’s ready to execute a massive fiery explosion that’ll erupt all around it. Other than that, you’re going to want to watch out for all the attacks that Teostra can execute from midair. The Elder Dragon will occasionally rise up into the air, where it can either slam itself down on the ground, delivering an area of effect attack, or breath fire in a line across the battlefield, and we’d recommend strafing around the beast whenever it’s in the air. Teostra the Infernal might be one of the tougher fights in Monster Hunter World, but it’s entirely doable with a squad at your back. 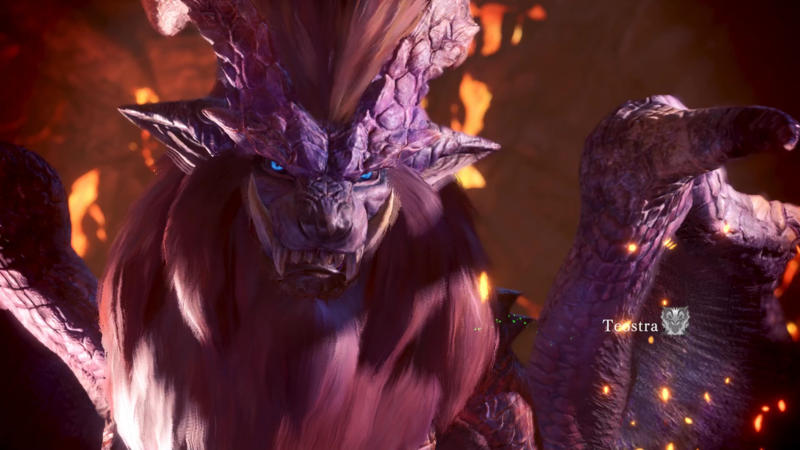 We might be all done with our guide on how to take down the powerful Teostra the Infernal in MHW, but why not continue ahead to our other Monster Hunter World guides, including our guide to the best armor in the game, as well as our complete weapons guide.